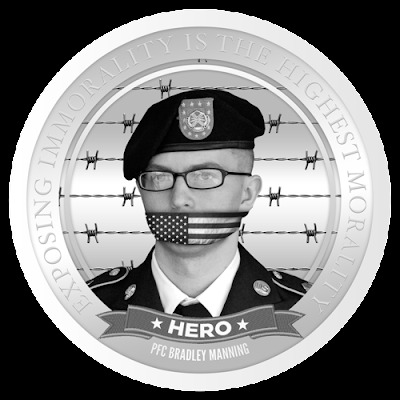 The Bradley Manning Coin Project, The Hero, seeks to increase awareness about PFC Manning and these issues, to raise money for his legal defense, and to memorialize this moment in history when a young man stood for what was right, spoke truth to power, and gained the support and admiration of people world-wide. 100% of the proceeds from the sale of this coin will go towards Bradley Manning’s legal defense fund. It is not a word we often use. Typically we prescribe it to fictional characters created in our minds because they so infrequently appear in real life. The truth is, heroes do not set out to be heroes. In 2010, 23 year old PFC Bradley Manning saw something – acts of egregious disregard for human life, coverups by world governments, and information that would forever change the way history perceived American militarism in the twenty-first century. What would you do if you had access to classified information, the substance of which affected the lives and future of an entire planet? Would you selfishly keep it to yourself, or would you do as Manning did and share it with the world? Among the documents and videos that Manning allegedly shared with Wikileaks founder, Julian Assange, was a video where soldiers aboard a U.S. Army Apache helicopter rained hell fire down on a group of civilians including two children and two Reuter Reporters they mistakingly took for opposition forces. This “Collateral Murder” video legitimized the debate as to whether the wages of U.S. military adventurism was worth whatever national interest for which the rulers of the United States claim it is perpetuated. How would you feel if those children were your children? How would you feel if those reporters were your husband, your brother, your friend? Is it an acceptable loss? What do we gain? Along with the Afghan and Iraqi war logs, Manning shared diplomatic wires that shed light on the corruption of U.S. government officials that were both embarrassing and exposed the Bush and Obama presidential administrations for their war crimes. Much debate has been held over the morality of his decision. Was it right for him to share that information? Who owns information? Is information free? Does it belong to all of us? What role does information play in our lives? Are we truly safer if we are protected from the truth? There is no doubt that people have been hurt as a result of this leak. The question is – how many people were hurt before the leak and what will change to prevent more from being hurt now that we have the information. Will our governments change their foreign policy? Will officials and military personnel exercise more discernment and respect? Will citizens rise up and overthrow their tyrannical leaders? Some argue they already have. Both the Egyptian and Libyan revolutions can be linked to outrage over information leaded in these documents. Wikileaks has yet to confirm that Manning was the source of the leaks – citing their protocols to keep the whistleblower’s identity a secret. The media and our government has sought to distract us from what is actually happening here by diverting our attention to Assange’s personal life and Manning’s sexual identity and personal issues. Whatever Assange’s faults or Manning’s sexual preference, these issues are only static The gravity and the scale of Mannings actions are what he is and should be judged by. Bradley Manning gave to the world the smoking gun. It is up to us to do something with it. We created this medallion to honor the actions of a hero and to commemorate this moment in history when a boy spoke truth to power and arguably exposed more abhorrent, subversive, and illegal actions by more rulers and officials than in all of human history combined. 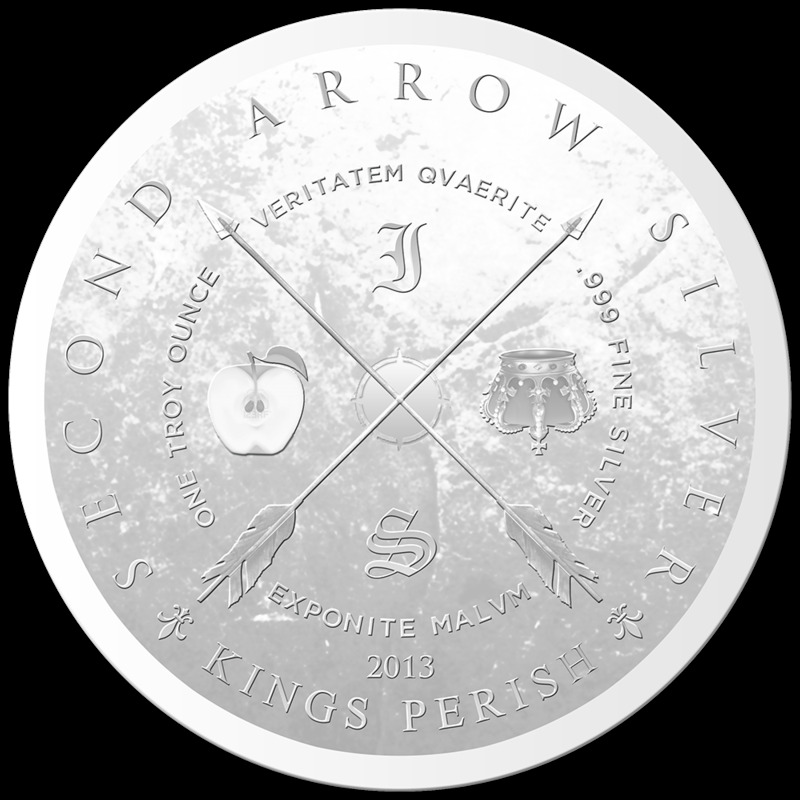 We put it on silver because of its precious, collectable nature. It will never be discarded, torn, worn, or decay. It will be preserved – possibly for hundreds of thousands of years. It will sit in the hand of some collector generations from now who will explain how important and significant Manning’s actions were and, hopefully how these actions began an age of truth-telling and whistle-blowing that resulted in a more free and transparent humanity. Exposing immorality is the highest morality.